A detailed Hangzhou guide from airport to sightseeing with our pick of the top Hangzhou business hotels and Hangzhou conference hotel options, boutique stays and heritage hotels on West Lake, Jakki Phillips, and more from Smart Travel Asia and Dancing Wolf Media. 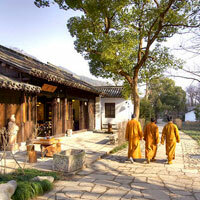 We look at romantic retreats, Hangzhou business hotels, and conference venues n this guide. Our pick of eateries, teahouses, temples, and snuggeries. And even a boutique inn or two. “BAMBAM Hotel,” said my taxi driver, beaming. Heart sinking, I peered at the grim industrial wasteland around us, cracked pillars, derelict apartment blocks with smashed windows, and not a pillow menu in sight. Surely this was not the Banyan Tree? I refused to exit, fearing the worst but, just then, a kindly lady came by and seeing my frazzled state, offered to interpret. Fifteen minutes later we pulled up outside the real McCoy. No broken tiles or cement mixers, just soft music, glowing lanterns, and towering bamboo. “Ah, Bambam!” the driver exclaimed in genuine delight, pointing happily at the hotel and then the map, still upside down on his lap, exactly as it had been our entire journey. Taxi rides are a real adventure in Hangzhou especially with the arrival of so many new hotels in exotic far-flung locations. But whether you’re staying in a slick business hotel on the banks of the West Lake or a peaceful retreat in the countryside, directions in Chinese and a map, are a must. Don’t forget your mobile phone. On with our Hangzhou guide. In 2010 Hangzhou Xiaoshan International Airport (www.hzairport.com/en) was shut down for an afternoon due to a UFO scare. I saw no aliens when I arrived, just bleary-eyed zombies marching towards the taxi queue. International passengers arrive in the new Terminal A, which opened July 2010. It has plenty of duty-free shops and some nice cafes offering decent coffee but rubbery sandwiches. Domestic flights arrive at the older Terminal B. Outside you’ll find rows of shuttle buses heading in several directions. The 27km journey into the city centre takes between 30 and 45 minutes (up to one hour at peak times) and will cost Rmb20 on the bus and around Rmb120 in one of the many taxis. Hangzhou is framed by hills to the west and the Qiantang River to the south. The city has grown around the nourishing spread of the eight square kilometre West Lake although the farther eastern side is the most developed tourist area. Nanshang and Hubin Road run along the lakeside and are lined with shops, bars and restaurants while the west remains relatively quiet. In the north of the city, Shuguan Road is also a growing nightlife district. Taxis are cheap and plentiful until around 3.30pm when drivers seemingly turn into frogs and hop into the lake. They actually change shifts and during this time no amount of thigh-flashing or money-waving will score you a ride. Taxis disappear from the roads for about three hours and this coincides, rather frustratingly, with rush hour. If you’re moving around between 3.30pm and 6.30pm it’s far quicker to jump on a bus, rent a public bike or simply walk. If you have a plane to catch or an important meeting, make sure you pre-book a ride with your hotel. Traffic is generally bad around the city and a five-minute journey one day can often take 25 minutes the next. You’ll pay an initial charge of Rmb10 for the first three kilometres, plus an additional Rmb1 fuel charge. Most short trips around the city will cost around Rmb15. Tipping is not expected. If you don’t speak Mandarin make sure you have the address and a map in Chinese. Print out or rip out pages from any Hangzhou guide. That’s what back pockets are for. Look out for brightly painted buses with the letter Y before the number – these are popular tourist buses that trundle between the main sightseeing areas. The bus stops are announced in English and Chinese and tickets cost Rmb3-Rmb5. Most are self service and don’t provide change. Public buses are cheaper costing around Rmb1 and a K signifies it has air-conditioning. More than 40 trains travel between Shanghai and Hangzhou each day. The new fast train takes 45 minutes and leaves every 30 minutes (more during peak times) from Shanghai Hongqiao Station. Tickets cost from Rmb82. Try and arrive at Hangzhou Railway Station (also known as City Station), which is closer to West Lake than East Station. There are thousands of fire engine red public bicycles stacked in designated ranks around the city. To use the bikes you’ll need to buy a special card from a Smart Card centre. A convenient office can be found at 20 Longxiang Qiao opposite the Agricultural Bank of China. The card requires a Rmb200 deposit and a Rmb100 prepayment and you’ll need to show your passport as identification. As well as the card, you’ll get a free map showing all the bike stations. Swipe your card against the bike rack to release your trusty steed. The first hour is free then it’s Rmb1-Rmb3 per hour after that. Swap bikes every hour and you could ride for free. Swipe the rack again when you return the bike – when you hear a beep you’ll know it is locked. You can also rent a pair of wheels from one of the many bicycle shops around West Lake but expect to pay as much as Rmb30 per hour. 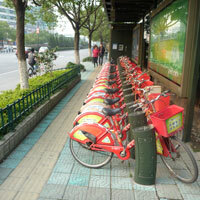 Many hotels such as Shangri-La Hangzhou and Wyndham Grand Plaza Royale loan bikes to their guests for free. If you’d rather follow a guide on a cycling tour around Hangzhou then try China Outside Adventure (www.china-outside.com/hangzhou.html) who offer full day or half day itineraries including stops at West Lake, three temples, a tea plantation and a street famous for local snacks. Local guides know all the best short cuts and will help you negotiate unpredictable traffic and herds of wandering tour groups. Use your bell aggressively, or buy a bazooka. If you fancy bobbing about on the lake then stroll along the waterfront and you’ll see dozens of places renting out rowing boats and offering various cruises. With the mist-shrouded mountains looming in the distance and the sun glimmering on its smooth surface, West Lake is about as picture-postcard as it gets. It's easy to spend three or four days lost in this enchanted world where pagodas peek out of forested hilltops and willows drape romantically over arched stone bridges. Stroll through gardens and along the tree-lined pathways, watch the world go by from the terrace of a traditional teahouse or drift along the water's edge in a boat. 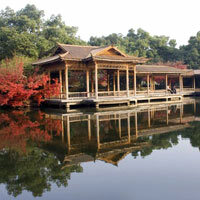 West Lake has more than 100 historic tourist sites ranging from museums, tombs and temples to gardens, pavilions and ponds. Paths run around the lake and along the causeways so it’s easy to explore on foot or bicycle. At weekends you’ll be fighting for space with cap-wearing tour groups so go early in the morning if you want this famous lake to yourself. Pick up one of the free tourist guides for maps showing suggested walks or rides. 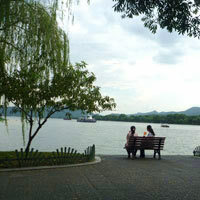 Alternatively, just stroll around and discover the secrets of West Lake at your own pace. If you're in a real hurry, flag down one of the buggies that whizz around the lake or jump on a tourist bus. There are ten famous points from which to view West Lake including Lingering Snow on Broken Bridge and Lotus in the Breeze at Crooked Courtyard. You can take a boat trip out to see Three Pools Mirroring the Moon – a trio of pagodas that appear to float on the water. If you think they look familiar then you're right, they appear on the one yen note. Your return to shore might be delayed by fellow passengers attempting to touch the pagodas for good luck. Not always a good idea in a small, tippy vessel. Follow the golden spire to reach Liefeng Pagoda and see the 1,000-arm Guanyin at the Jingci Temple. In spring the lotus blossoms are beautiful in Quyuan Gardens towards the northwest of the lake. For more panoramic views visit the Six Harmonies Pagoda, three kilometres southwest of the lake near the Qiantang River. West of Hangzhou there are a group of seven temples nestled in a valley amidst the forest. Jump on tourist bus Y1 or, if you’re feeling energetic, hire a bike and cycle there. At the Lingyin Temple you’ll see more than 400 Buddhist carvings on the hillside. Behind the temple is the Northern Peak, which can be accessed by cable car and offers a bird’s-eye view of the city. Bring your camera. 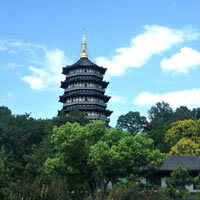 Also nearby are Fajing Temple, Fahua Temple and Faxi Temple. If you want to escape the humidity in summer or chilly breezes in winter then warm yourself up in one of the city’s many museums. Good options are the China Silk Museum, Museum of Chinese Medicine and Mausoleum of General Yue Fei. Pick tea before you drink it at the Dragon Well Tea Village and learn more about the history of this famous leaf at The National Tea Museum. Go shoulder-to-shoulder with the locals at Wushan Night Market and bag yourself a memento. Ceramic tea sets, painted paper umbrellas and silk fans are just a few of the bargains you can discover in the maze of bustling stalls. Haggling is expected – start your bidding low. The market operates from 6pm until 10pm every night on the junction of Runhe and Huixing Road. Qing He Fang Street is a historical area where preserved traditional buildings now sell everything from kitsch Mao memorabilia to Chinese herbs. There are also more than 100 stores selling trinkets and curios on Hefang Road. Wang Xing Ji Fans (tel: [86-571] 8783-0144) is a great stop for cooling souvenirs. The China Academy of Art is based on Nanshan Road and dozens of arty boutiques and galleries have sprung up between the bars and restaurants. Check out the YN Art Institution (tel: [86-571] 8702-4609) for contemporary oil paintings. If you’re interested in purchasing some of Hangzhou’s famous silk goodies then head to Xinhua Road (Silk Road) and stock up on ties, scarves and cushions. Fashion shopping can be continued at Wu Lin Road (Ladies Street) and the Si Ji Qing dress market on Hanghai Road. For all your digital and electronic needs walk down to Wen San Lu, also known as “IT” street. the region’s famous Longjing Tea, also called Dragon Well Tea. Take your tea caddy and stock up at the West Lake Tea Shop (tel: [86-571] 8780-7457) on Hefang Street or Meijiawu Tea Culture Village slightly out of town on Meiling Road North. All this should provide your Hangzhou shopping fix. Teahouses have been a part of Hangzhou life ever since the Song Dynasty and are the perfect place to soak up some local atmosphere. Feed seeds to the caged songbirds or join in a raucous game of cards. Stroll around the lake and you’ll be spoilt for choice. Tea usually comes with a selection of snacks and slurping is often drowned out by live Chinese music. Harder to find but definitely worth the effort is the Chenhuang Teahouse (tel: [86-571] 8701-1855), perched high above the city at the Chen Huang (City God) Pavilion. Enjoy panoramic views of the city as well as lashings of oolong. At the Shentang Scenic Spot you’ll find Lake View Teahouse (tel: [86-571] 8702-1618) where you can sip flower tea at the water’s edge. Or try one of the city’s most popular teahouse chains Qing Teng (tel: [86-571] 8702-2777). The Yuanhua Plaza branch has live music, snacks and a buzzing atmosphere. The wonderful thing about Hangzhou’s famous local dishes is that they come with a story. Before you start scoffing it down, ask a member of staff to tell you the legends behind dongpo pork and beggar’s chicken. You’ll find regional favourites on the menu at Lou Wai Lou restaurant (tel: [86-571] 8796-9023), housed in an ancient building dating back to 1848 on Gushan Road. Zhi Wei Guan (tel: [86-571] 8706-5871) on Renhe Road has a 100-year history and is famous for its steamed buns filled with pork, shrimp and eggs. For some of the best noodles in town head to Kui Yuan Guan (tel: [86-571] 8701-2043) on Jiefang Road or tuck into a bowl of duck and bamboo shoot soup at Zhang Sheng Ji (tel: [86-571] 8602-6666) on Shuangling Road. For local street snacks go to He Fang Jie and buy steamed treats and spicy delights for around Rmb10 each. On Shuguang Road you’ll find Spanish restaurant Le Pedrera (tel: [86-571] 8886-6089) conjuring up tapas, Provence (tel: [86-571] 8797-6115) dishing out French fare and Mango Thai (tel: [86-571] 8797-5877) serving up curries, spicy salads and fruity cocktails. And if all you’re craving is a cheesy pizza, then pop into Angelo’s (tel: [86-571] 8521-2100) on Baoshi Hill. Hangzhou’s nightlife picks up at the weekend but is fairly quiet during the week. The best place to find some local drinking buddies (and a fair few expats) is Maya Bar (tel: [86-571] 8602-6666) on Jiefang Road. Run by the American editor of what’s on magazine More Hangzhou (www.morehangzhou.com), it has a friendly pub atmosphere, jars of pickled snakes on the shelves and a happy hour between 7pm-9pm. Order your poison wisely. Expect rocking tunes and tasty snacks. The Reggae Bar (tel: [86-571] 8657-5749) on Xueyuan Road has a slamming sound system and a darts board and pool table upstairs, or for live jazz and a trendy crowd mosey on over to JZ Club (tel: [86-571] 8602-6666) on Liuying Road. For a burger and a pint in a cosy lounge setting try Eudora Station (tel: [86-571] 8791-4760) on Nanshan Road or for a generous gin and tonic among mellow folk, pull up a stool at 7 Club (tel: [86-571] 8511-5795). Cocktails with a view are served up at Belle Vue at the Hyatt Regency (hangzhou.regency.hyatt.com) while mean martinis are both shaken and stirred at The Bar at The Four Seasons (www.fourseasons.com/hangzhou). Friendly banter and top tunes combine to make unpredictable evenings at Mint Lounge at the Tea Boutique Hotel (www.teaboutiquehotel.com). If you want a dose of hot and sweaty clubbing then squeeze into your skinny jeans and head to G Plus (www.clubgplus.com) on Qinchun Road or its equally pumping neighbour, the 88 Club. If you spot a red light in the window of one of the small local hairdressers in the back streets around Shuguang or Nanshan Road, think twice about popping in for a blow dry. You might end up receiving a service that really makes your hair stand up on end. While some hotels boast they are only 25 steps or just 50m from the banks of the West Lake, there is one property that brings the lake right to its guests. Opened October 2010, Four Seasons Hotel Hangzhou at West Lake brings water features into the heart of the picturesque grounds. Nature is everywhere with streams, ponds and lagoons weaving through the lush gardens, not unlike a classical Chinese painting, with the traditional grey-stone Jiang Nan architecture blending seamlessly into West Lake. The Four Seasons certainly makes an impression and, not unsurprisingly, rates high on our Hangzhou hotels review. Rooms are divided between East and West Wings and only residents have access via swipe cards. There are just 78 rooms starting from the spacious 63sq m Deluxe. Make the most of blazing sunsets over West Lake and upgrade to a Premier Room, which has a terrace or balcony. Rooms meld tradition with chic contemporary and modern amenities such as iPod docks, Nespresso coffee machines, DVD players and laptop-size safes. The 37-inch flatscreen TVs are cleverly hidden inside wooden cabinets and rise up with the push of a button. Hide the controller and head to the balcony instead. If you must, there are cables allowing you to connect laptops and gaming devices to the TV. Elegant marble bathrooms come with freestanding tubs, rain showers, TVs in the mirrors and L’Occitane toiletries (Bulgari in suites). There’s a comfortable wooden work desk and a handy universal power outlet that can accommodate all manner of leads and chargers. WiFi is Rmb100 per day. The 140sq m Lake View Corner Suite comes with a spacious terrace and the best views in the hotel. The silk and serenity combine to make this one of the best Hangzhou luxury hotels. An ornate wooden walkway leads you under hanging willows and past small pagodas to Jin Sha Chinese restaurant. There are 11 private dining pavilions each with a unique design. Black and red moon gates welcome you to nine private suites in the spa where treatments are inspired by the 18th century Emperor Qianlong. Get some right royal treatment with the Imperial Consorts and Concubines Perfumed Water Ritual. Swimming in the West Lake is forbidden but the outdoor infinity pool at the Four Seasons is the next best thing. Lake water flows around the pool like a moat and the views are spectacular, particularly in the late afternoon sun. There’s also a palatial indoor swimming pool surrounded by colourful cushioned alcoves and a fitness centre overlooking the gardens. Four Seasons staff will happily look after children for free in the Kids For All Seasons play area. The service must be pre arranged with the concierge and is not suitable for babies. Teenagers will head to the Young Adult Centre to play table football, try out a digital drum kit, or a racing car simulator and a raft of whiz PS3 games. For corporate meetings or weddings, there is a 320sq m ballroom with a terrace overlooking the lagoon. Shangri-La Hotel, Hangzhou may not be the newest or most sparky kid on the lake but like an old friend, it’s reliable, friendly, and reassuringly familiar. Its location is superb – walk across the road and you're at West Lake. It’s also very convenient for the famous Impressions of the West Lake show that is staged nightly on nearby Yue Lake. 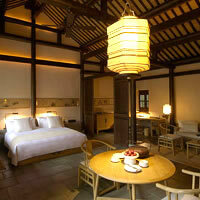 Rooms favour traditional comfort rather than the contemporary chic of Hangzhou’s newer properties. The hotel is divided into an East and West Wing with most of the standard rooms located in the latter. Make the most of the hotel's address with a Deluxe Lakeview Room. While you won't manage to fit your laptop into the rather small safe, you can zone out in front of the 32-inch flatscreen TV. There's also free plug-in Internet, iron and board, tea and coffee facilities, mini-bar and bath with overhead shower. The rooms are spacious with patterned carpets underfoot and plenty of cushions. Pay a little more and you can make use of The Horizon Club business lounge on the sixth floor. Enjoy breakfast on the panoramic alfresco terrace with a nice pot of steaming hot tea. Head to the Garden Bar for afternoon tea or live jazz every night from 8pm. Guests tend to be more mature and the result is a quiet atmosphere around the resort. Beneath the East Wing there is a health club with swimming pool and fitness centre but no spa. There are also bicycles that you can use at no charge. Wyndham Grand Plaza Royale West Lake on the northeast corner of the lake is a convenient five-minute stroll from the water’s edge. Pin-stripers won’t need to break a sweat as the business district is only a short walk. Shoppers exploring Wu Lin Street (ladies’ market) can easily stagger back after loading up. Although the lobby is often bustling with laptop-swinging travellers, those enjoying a holiday are well catered for. The health club has a pool suitable for lap swimming, hot and cold tubs, a sauna, steam room and whirlpool. If aquatic fun isn't your thing, play some table tennis, have a game of pool, borrow a bike or head to the gym. Once inside your room fling yourself down on the enormous, plump bed. Order a lavender pillow from the bedside menu for an even deeper slumber. Plush furnishings in warm gold and chocolate tones create a welcoming ambience. All of the 283 rooms have 37-inch flat-screen TVs and balconies with views over the city or hills. Deluxe rooms start at a generous 50sq m and almost all have baths and separate rain showers. Amenities include work desk, free Internet, laptop-sized safe, iron and ironing board, tea and coffee facilities and mini-bar. Rooms on the Executive Floor also have iPods and DVDs and access to the panoramic business lounge. For great green curries try the Thai restaurant. Companies looking for meeting space – or decent Hangzhou business hotels – should consider this address with its 400-person ballroom and eight function rooms. Executive Club guests can use a small meeting room at no charge. Not only does Hyatt Regency Hangzhou have a much sought after location overlooking the iconic West Lake but it also has a cocktail bar with killer views and a restaurant serving superb local dishes. Belle Vue is on the second floor and mashes up some of the best mojitos in town. Head there for sundowners and to watch the city light up around the lake. Famous local dishes definitely worth a try at Hubin 28 restaurant include song sau fish soup, river shrimp with Longjing tea and dongpo pork. Regency Club members also have exclusive access to the eighth-floor rooftop garden. All 390 rooms have smart contemporary decor with well appointed furnishings in cream, gold and amber. Soft armchairs, silk cushions and tasteful lamps ensure a comfortable stay in classy surroundings. The 36sq m West Lake King room provides those all-important views and plenty of stretch space. There's a marble bath with separate shower, 25-inch LCD TV, work desk, Internet, safe, iron and board, hairdryer, minibar and tea and coffee facilities. The Health Club has a gym with personal trainers and a 25m swimming pool. Head to the spa for a 60-minute Hangzhou flower body scrub using osmanthus and green tea to exfoliate, purify and tone the skin. The MICE market is also well catered for with 20 modern function rooms. 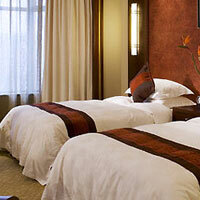 The Hyatt is a good choice among Hangzhou conference hotels with service and facilities to match most expectations. 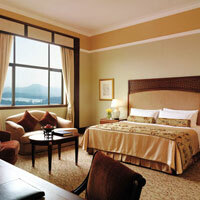 Just up from the Hyatt Regency is the modern but rather nondescript Sofitel Hangzhou Westlake. Despite its advantageous location and unobtrusive low-rise mien, no rooms have direct lake views and many look out on to busy Westlake Avenue. Later, a section of the road will be transformed into a canal linking the lake with the city's inland waterways. Look forward to some river view rooms in 2012. Quieter rooms face the rear of the hotel overlooking apartment blocks. While the views may not impress, the location most certainly will. 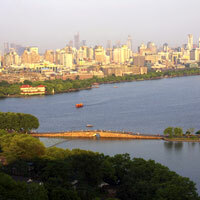 West Lake is only a few steps away as is the up-and-coming Xihu Tiandi shopping and dining district. The 200 rooms are clean, classic, and comfortable and start from 42sq m. Furnishings are simple with bold orange wall panels, red armchairs and white lamps. It's all pleasant enough. Sofitel's signature "My Bed" should ensure a good night's sleep and the bathroom has both a tub and rain shower. There's also a 37-inch flatscreen TV, free Broadband, a work desk, small safe and iron and board. In peak seasons (April to June then September to November) head up to the rooftop for barbecue buffets as the sun sinks from the sky. Venture down to the basement to find the Balinese-inspired spa, small swimming pool, gym and beauty salon. There are several function rooms if corporate meetings in Hangzhou are what you are researching, and the largest of these, Xi Hu, can host up to 130 people banquet style. Located inland and away from West Lake is Oakwood Residence Hangzhou. Although not as convenient for sightseeing, these Hangzhou long-stay serviced apartments are close to a cluster of multinational companies and the Yellow Dragon commercial area. West Lake is only about 10 minutes away by taxi. If you're considering a longer stay in the city or are travelling with your family, these apartments can offer a practical and money-saving alternative to a hotel. The South Tower opened in 2008 followed by the North Tower early 2011. There are 321 rooms ranging from 35sq m studios to 138sq m three-bedroom apartments. The tasteful contemporary decor is easy on the eye with modern art adding bursts of colour. Armchairs and lamps lend a homey charm and guests can choose light or dark wood furniture. You'll have everything you need for a stress-free stay including Western-style kitchen (including washer dryers, freezers and microwaves), TV, DVD players and multi-channel digital TV and work desk. In-room Internet costs Rmb80 per day but WiFi is free in public areas. Some apartments come with a rain shower but not baths so check if you really like a good soak. Short stay guests will have their rooms cleaned daily but long stay guests (over one month) only twice a week. Toiletries are also provided. If you want to dine out or work out, you’re in luck. There are restaurant in both towers, a bar, swimming pool and gym. Meeting rooms are also available as are business centre services, and a 24-hour concierge. We continue with our Hangzhou guide to hotels. But now for something different. While big brand hotels seem to be opening on every corner, designer pads have been slow to follow. The first to rear its funky head is the reasonably priced Tea Boutique Hotel, on the busy Shuguang Road near the Dragon Stadium. Keep your eyes peeled as this place is easy to miss. Sliding glass doors welcome you to a surreal but beautiful lobby with a huge wall dedicated to a misty photo of West Lake with a levitating tree and giant blue lily pads. The floor design looks like stepping stones leading to the water’s edge. This cool and creative hotel has only 43 rooms spread over four floors. Standard rooms are decked out in natural fabrics and have a fresh and contemporary feel with smooth lines and clean edges. Some face the busy road and while the windows do a good job of blocking out the noise, you may hear some revving and beeping. Rooms facing the school behind are quieter. Facilities are more than adequate with 34-inch TVs, free WiFi, laptop-size safes, ironing facilities, work desks, baths, rain showers and hairdryers. Unsurprisingly tea is also a key element and every room has a delicate tea set. You’ll find Longjing tea leaves and the best water for brewing, Tiger Hill Spring Water. 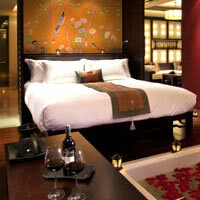 The most spoiling and most expensive room (Rmb1,800) is the Tea Boutique Suite. Expect a large comfortable lounge, kitchen and stylish white-tiled bathroom with freestanding bath and separate rainshower. Look out for the tree growing on a pile of egg cartons. Behind reception is the hip and happening Mint Bar offering salsa on Saturdays and half price cocktails for ladies on Thursdays. There's also a Thai-style spa with six treatment rooms. Staff will help you get a taxi and the city centre is less than 10 minutes away. As far as Hangzhou boutique hotels go, this one should be top in your diary. A new city centre is rapidly developing to the east of the city by the Qianjiang River but at present there are more cranes and building sites than people. Government offices will later relocate to Qianjiang New Town and eight new hotels are expected to open in this area including Jumeirah, St Regis, Marriott, Hilton and Park Hyatt. A Metro system is also under construction and phase one will see three stops opening in this up-and-coming area. Already attracting crowds is the MIXC shopping mall with its Olympic-size ice rink, Hangzhou Grand Theatre and a riverside plaza called City Balcony. 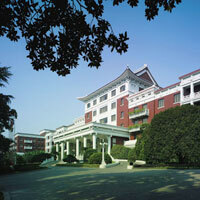 InterContinental Hangzhou flung open its doors in December 2010 and is one of the first hotels to open in the area. It is part of an integrated complex comprising the Hangzhou International Conference Centre and shopping mall. 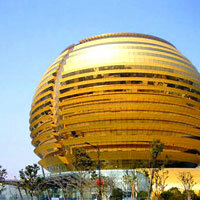 The hotel mimics the sun, a giant golden orb, and faces the Grand Theatre, which resembles a crescent moon. Locals call the hotel the “Ferrero Rocher”. It is certainly a sight to behold. The glimmering globe dominates the skyline but taxi drivers are often puzzled by the address, so make sure you have that all important map. As the MICE market picks up, footsteps will echo in the 85m-high circular lobby. The pillar-less 1,780sq m ballroom is one of the largest in the city and there are 26 meeting rooms and 10 translation booths that can cater for intimate corporate meetings or international conferences. Media facilities include a video conferencing room and a TV broadcast room. There are 393 rooms with views over the city or river. The layout is neat and practical with amenities stored exactly where you want them. Contemporary art adds sprigs of colour to the white walls and circular brown velvet armchairs beckon by the window. Deluxe Rooms are 52sq m and come equipped with mod-cons such as Bose entertainment systems, DVDs, iPod docks, flat-screen TVs and fancy digital phones. At present WiFi is free although this may change as business picks up. There’s a bath and rain shower, and toiletries by Elemis. The walk-in closet houses a laptop-size safe and iron and board. Espresso lovers will appreciate the swish Italian coffee machine. Suites and Club Rooms come with a fully equipped kitchen. Dining options include The Noodle Factory, a Chinese restaurant and a German microbrewery. Keep your beer belly at bay in the swimming pool and gym or have it slapped and kneaded in the spa. The InterContinental makes for an interesting – and jaw-dropping – choice among the top Hangzhou conference hotels. Unlike some hotels that recreate the beauty of Hangzhou with man-made lagoons and landscaped bamboo gardens, Aman Resorts chose to restore a traditional Chinese village in a quiet valley. The buildings at Amanfayun date back 180 years, giving the resort a sense of depth and permanence. It takes 15 minutes by taxi to reach the resort, which is situated on 14 hectares of rustic countryside deep in a bamboo grove. Seven temples surround the property; the closest is a five-minute walk and the farthest a 40-minute hike up into the hills. The 42 rooms are dotted among terraced tea fields and shady magnolia trees. Village Rooms start from 66sq m while the 290sq m Amanfayun Villas offer the most stretch space. Fragrant jasmine, osmanthus and wild roses line stone pathways that lead you over small bridges as you weave through this romantic hideaway. If you’re looking for peace and quiet then you’ve found it – apart from the chirping birds and gushing river that is. Amanfayun embraces the local community and has an open policy that allows tea pickers and monks to stroll through the grounds on their way to work or prayer. An archway and private courtyard leads to the Deluxe Village Room. High ceilings, cool stone floors and minimal furnishings create a serene, uncluttered environment. A bed surrounded by decorative screens dominates the living space while wooden pillars and hanging lanterns add an air of cosy chic. Chinese poems hang on the wall above an attractive ceramic tea set. The bathroom is big on personality with old-fashioned taps and toilets with chain flushes. There’s a rain shower but no bath. If you crave a good soak then head to the bathing house and sink into one of the huge circular wooden tubs. The bathhouse is free for guests but tubs should be reserved in advance. Likewise rooms don’t have TVs but you can request one in advance. Traditional elegance is complimented by modern perks such as a Bose sound system, including a CD of traditional music, broad-rim sun hats and anti-mozzie kits. The effortless style of this charming resort extends to every restaurant and tea lounge, all of which are beautifully designed in natural woods with Chinese art, lanterns and hanging birdcages. Try the warming simmer soup served in a pottery jar at Hangzhou Lounge and the dumplings at The Steam House. Amanfayun can arrange a tour of a nearby tea plantation and the bilingual guide will help you chat with local tea pickers. Fayun Place, the resort’s oldest building dating back some 180 years, completely fools the eye, appearing much smaller than it actually is. From the outside it looks like a quaint little house but inside there are endless rooms, some bright and airy and others softly lit with corner sofas piled high with cushions. Grab a book from the library and a pot of tea and curl up in one of the sunny snuggeries for some blissful afternoon chilling. Paths are a little rugged so ditch the heels and slip into comfy flats. Buggies are available to transport you around the resort although nature lovers may prefer to potter among the plants. The spa offers traditional foot massages and intriguing treatments using bamboo. You can also brew yourself in a bath with some Longjing leaves. Reach through the spa windows and you can actually touch the golden wall of a neighbouring temple. Join in a tai chi class or practise in the yoga room. There’s also a large gym and a heated outdoor swimming pool with views over the resort. Convenient for sightseeing in Hangzhou yet appropriately hidden away among temples and tea terraces, Amanfuyan is perfect for those seeking a romantic retreat or relaxing sanctuary. This is clearly among the best Hangzhou luxury resorts on the menu, though luxury is a word the group might frown at, preferring “understated”. The first thing you notice when you arrive at Banyan Tree Hangzhou is the assault, not unpleasant, on your ears. 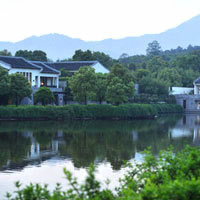 Located to the west of Hangzhou in the Xixi National Wetland Park, the resort is alive with the chatter of birds. Borrow a pair of binoculars from reception and head to the viewing area, or get a closer look on one of the wetland boat tours. Like many of the more hidden resorts, Banyan Tree is not the easiest to reach despite being only 25 minutes away from town by taxi. Well, at least my taxi driver now knows Banyan Tree, or “Bambam” as he likes to call it. Modelled after a traditional wetland village and incorporating the Jiang Nan style of architecture, the resort has 72 Water Terraces and Villas. First impressions are striking. An ornate bridge curves over a blue lagoon beyond which is a solitary pagoda surrounded by clouds of steam. Willows sway in the cool breeze and lanterns dangle from towering bamboo. Most rooms look over the lagoon with terraces and balconies offering shaded hideaways. Inside, the decor is elegantly modern with hints of Chinese chic. Dark wood floors offset vivid splashes of colour while oriental flourishes come in the form of carved furnishings, silk brocades, embroidered fabrics and detailed tapestries. Contemporary comforts include flat-screen TVs, DVD and CD players, work desks, free WiFi and flowery robes and slippers. An imaginative layout results in a choice of areas for reading, chilling and dining. Your daily fruit bowl comes with a guide so you can identify your persimmons from your loquats. The ever-changing aroma in the rooms is a surprise – the incense and aromatherapy oil is changed daily. Outdoor jet pools, large terraces and private courtyards make the two-bedroom villas a tempting choice for families while bedroom bathtubs make the Premier Water Terrace fun for lovey-dovey couples. Regency style furniture and contemporary black chandeliers mingle with old-fashioned typewriters, telephones and gramophones in The Library. There’s also a tea lounge and a restaurant with a menu of Hangzhou and Cantonese dishes. Forget early sessions in the pool or gym – opening hours are 10am until 10pm. Splash around with an oriental bath ritual or try the 180-minute Royal Banyan therapy, which includes a ginger and lemon scrub, back rub and herbal pouch massage. Banyan Tree is another well-positioned contender on this Hangzhou hotels review. If you’re looking for a stylish rural retreat in the heart of the Hangzhou countryside then jump in a taxi and travel 45 minutes southwest to the Fuchun Resort in Fuyang. It’s not an ideal location if you’re planning a hectic schedule of sightseeing but if you want to lose yourself in the natural beauty of the region, this makes for a serene hideaway. The scenic 220-acre property is built in the middle of a tea plantation and circles a placid lake. The skyline is dominated by cloud-topped mountains and an 18-hole golf course sweeps around the perimeter. An essay in quiet indulgence, Fuchun Resort manages to blend past traditions with contemporary opulence. Citrus tones lead down hushed corridors and candles flicker under dramatic wooden beams. There are 80 rooms ranging from the 36sq m Deluxe to the whopping 2,000sq m Fuchun Villa. Deluxe Rooms have a natural elegance with dark wood floors, crisp white walls, subtle art motifs and solid, antique-style furnishings. Box TVs are being replaced by LCDs, and other amenities include rainshowers, free WiFi, laptop-size safes, minibars and tea and coffee facilities. Watch the sunrise from a 72sq m Lakeview Terrace Suite, which offers a secluded and generous outdoor patio. There’s a flat-screen TV, deep soaking tub and a dining table for four. If you have a big family and even bigger pockets, consider splashing out on one of five secluded Fuchun Villas, which cost from Rmb20,000. If you don’t want to walk then hop in buggy or enjoy the walk past rows of mandarin trees. You’ll see the guilty little fruit imprisoned in small decorative brass cages around the resort. If you’re feeling peckish – set one free. The four-bedroom villas offer families endless stretch spacious and a separate building houses a large swimming pool. Back at the main hotel, kids have their own pool with frothing water fountains and a wall lined with inflatable dolphins, beach balls and kick boards. A kids’ library is stacked with books and games, plus there’s an outdoor playground, all helping to make this a very child-friendly Hangzhou hotel. The Fitness Nook is a small but modern gym and an Indian master teaches yoga in a sunny room with views over the mountains. At the cosy spa try a foot massage using Longjing tea or a two-hour treatment that nourishes the skin with lotus blossoms and rice wine. Sip afternoon tea at the Lake Lounge, enjoy local delights at Asian Corner restaurant or feast on Shanghainese dishes at T8. If you’re looking for a romantic escape or a peaceful retreat with a scenic golf course – Fuchun Resort is a stylish and contemporary property that fares well in our Hangzhou hotels review. From heritage hideaways to chic lakeside retreats, and from Hangzhou business hotels to conference venues, the city has accommodation for every taste and wallet. Simply hop in a cab and holler “Bambam”. 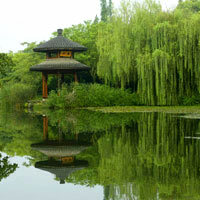 Hangzhou has a subtropical climate with four very distinct seasons. Plan your trip for the months either side of summer – April and May and October and November – when temperatures aren’t too high and the wind not too chilly. June is the wettest month and snow occasionally falls in December. Room rates may be subject to a 15 percent service charge unless stated otherwise. The exchange rate is currently around US$1=Rmb6.21. Pick up a copy of free listings magazine More Hangzhou (www.morehangzhou.com) found at many hotels and restaurants for the latest goings on. Most taxi drivers will not speak any English so make sure you have the address and a map with directions in Chinese. Tipping is appreciated but not expected. Most major hotels will provide Broadband Internet and Internet cafes are scattered across the city offering access for Rmb2-3 per hour. Amanfayun. Tel: [86-571] 8732-9999, fax: 8732-9900, (e-mail: amanfayun@amanresorts.com or www.amanresorts.com/amanfayun/). Banyan Tree Hangzhou. 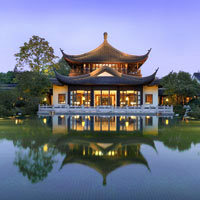 Tel: [86-571] 8586-0000, fax: 8586-2222, (e-mail: reservations-hangzhou@banyantree.com or www.banyantree.com/en/hangzhou/). Fuchun Resort. Tel: [86-571] 6346-1111, fax: 6346-1222, (e-mail: reservation@fuchinresort.com or www.fuchunresort.com. Four Seasons Hotel Hangzhou at West Lake. Tel: [86-571] 8829-8888, fax: 8829-2298, (www.fourseasons.com/hangzhou/). Hyatt Regency Hangzhou. 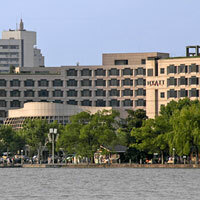 Tel: [86-571] 8779-1234, fax: 8779-1818, (e-mail: hangzhou.regency@hyatt.com or hangzhou.regency.hyatt.com). InterContinental Hangzhou. Tel: [86-571] 8981-0000, fax: 8981-0008, (www.ichotelsgroup.com/intercontinental/en/gb/new-hotels/hangzhou). Shangri-La Hotel, Hangzhou. Tel: [86-571] 8797-7951, fax: 8707-3545, (www.shangri-la.com/en/property/hangzhou/shangrila). Sofitel Hangzhou Westlake. Tel: [86-571] 8707-5858, (e-mail: sofitel@sofitelhangzhou.com.cn or www.sofitel.com). Oakwood Residence Hangzhou. Tel: [86-571] 8899-3131, fax: 8899-3030, (e-mail: reserve.reshangzhou@oakwoodasia.com or www.oakwoodasia.com). Tea Boutique Hotel. Tel: [86-571 8799-9888, fax: 8799-6123, (www.teaboutiquehotel.com). Wyndham Grand Plaza Royale West Lake. Tel: [86-571] 8761-6888, (www.wyndham.com).